Ask any reputable winemaker and he or she will tell you that some of the world's finest wine is produced with not only the quality of the grapes picked but the soil and climate of the appellation that vintage year. And just like a fine wine, Ingersoll Wine & Spirits is pleased to introduce to you our new website: Ingersollwine.com, a concerted effort to bring you the combination of over 20 years of retail wine experience and information-age technology to better serve you the customer. New wines arrive daily. We have more than 2,500 different wines available to you at a given time. Listed here are only a partial listing of wines available in our store. If you don't see what you are looking for please let us know. We hope that your online shopping experience is at least as comparable to what our customers know it to be at Ingersoll Wine & Spirits! Your neighborhood wine store. This has been our motto for 19 years. 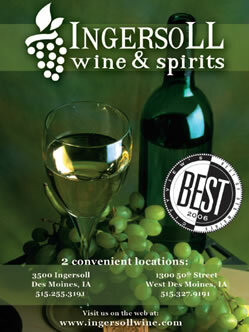 Located just west of beautiful downtown Des Moines, Ingersoll Wine & Spirits is central Iowa's original wine and liquor store. In October of 2001 IWS opened a second store in West Des Moines, IA. We are a locally-owned family operated business that is committed to providing you, our customers, with quality products at a reasonable price. Hopefully our website will reflect our level of service and commitment which we have provided since 1987. Here's what Cityview magazine had to say about us in the February 16th 2006 edition -- Best Liquor Store and Runner-up Best Wine Store. "For the past 19 years, Ingersoll Wine & Spirits has been elevating alcohol consumption into an elegant art form -- whether you're looking for a beer from Kenya or the finest French Champagne, the experts at Ingersoll will help you make a beverage selection that will impress the [heck] out of your significant other, or make you the instant life of the party. And with regular wine tastings and a new location in West Des Moines, Ingersoll is making it easier than ever to meet your alcohol needs in high style." Join the Ingersoll Wine & Spirits Wine Team! IWS is hiring. We are looking to fill full and part-time positions at our 3500 Ingersoll Avenue location. If you are interested in being a part of a fast-paced, customer-oriented environment, please send us your curriculum vitae to 3500 Ingersoll Avenue, Des Moines, IA 50312. For faster response, e-mail us with your attachment in Word format to ingersollwine@aol.com. Click here for an employment application!